CreekVine Designs creates everyday furniture and accessories for the home and garden using a classical and high end western red cedar wood and can craft their products from other materials such as oak, cherry, poplar, mahogany, pine, or another wood of your choice. Western Red Cedar is, above all, a wood of exceptional beauty. In its natural, unfinished state, it has a richly textured, tactile grain combined with a palette of warm, mellow tones ranging from light amber to deep honey brown. No man-made material can duplicate the depth of cedar's natural luster. It also remains subtly aromatic, and the characteristic fragrance of cedar adds another dimension to its universal appeal. Western Red Cedar contains natural oils that act as preservatives to help the wood resist insect attack, termites and decay. Cedar is also a dimensionally stable wood that lies flat and stays straight. Properly finished and maintained, Western Red Cedar ages gracefully and endures for many years. If left unstained/unsealed, Western Red Cedar will weather to a silver/gray patina look and will maintain a very smooth texture. Availability: Typically Ships in 3 Business Days. 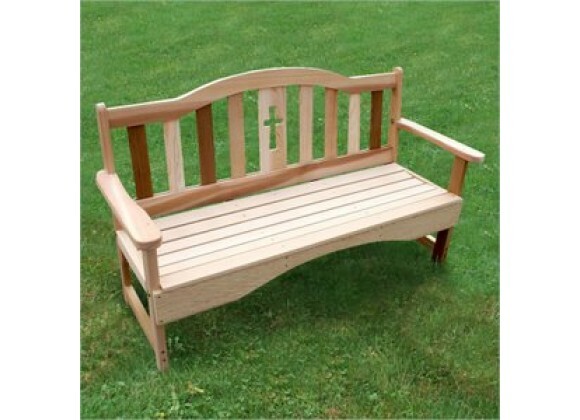 Give your garden or patio a spiritual touch with this Holy Cross Bench. With a simple, but powerful cross cut from the center back-slat, a hint of faith will reside with your flowers and lawn all day long. Seat Slats: 2.75" x .625"